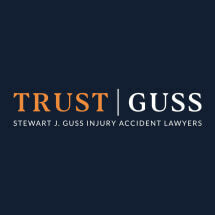 Mr. Guss is an AVVO Clients' Choice Award winner and was named by Houstonia Magazine as one of Houston's Top Lawyers. Mr. Guss and the rest of his legal team are proud to be approachable, informative and dedicated. Mr. Guss is always available to answer client's questions, personally address their concerns and aggressively advocate for them against the insurance companies. Research his reputation, reviews and career accomplishments, and you will see why he is considered one of the top personal injury lawyers in Houston. Stewart J. Guss, Attorney at Law, is deeply involved in the local community. Every year, his law firm sponsors a riding team for the MS 150 in order to help fight multiple sclerosis. Mr. Guss also underwrites Reach Unlimited, a Harris County charity that provides support to adults with developmental disabilities. For a free initial consultation about any personal injury case, feel free to contact his firm. We look forward to speaking with you. Personal Injury attorney in Houston. If you are injured at the hands of another, the law gives you the right to recover for your damages. No matter how careful you are when you drive, there will always be someone else who is not paying attention and causes that terrible car accident. Mr. Guss was wonderful. He fought hard against the insurance company to get us what we deserved.